These adjustable lenses from Adaptive Eyewear literally blew our minds this morning. With a liquid-filled lens, wearers can self-adjust using syringes plugged into the arms, until the prescription is just right for them. The idea for the concept specs, is rooted in global outreach for developing countries. 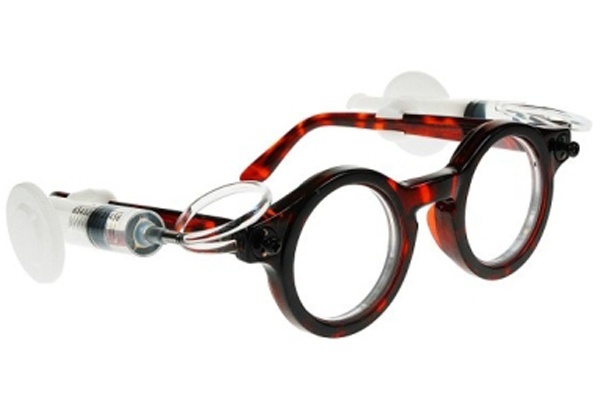 Adaptive Eyewear hopes to provide vision correction on a mass level, for those who could not otherwise acquire it. The frames are factory produced and then tweaked on location making them very inexpensive to manufacture. To learn more about Adaptive Eyewear and their Vision For a Nation program, click here. This entry was posted in Eyeglasses and tagged Adaptive Eyewear, Adjustable Eyewear. Bookmark the permalink.